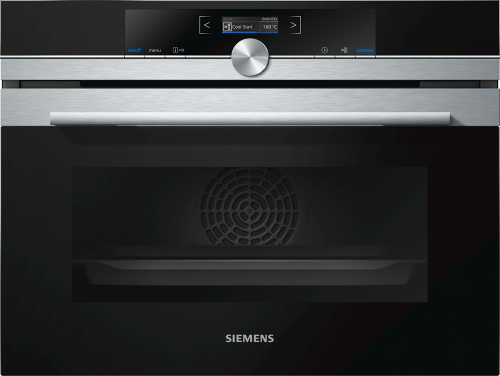 Not everyone needs a full size oven, and for those who don’t the CB675GBS1B Stainless Steel Compact45 Oven is here to offer a solution. Sporting a very generous 13 functions, you needn’t compromise on performance and usability. Never suffer the aural agony of a slammed door again with the smooth closing technology known as softMove. A patented mechanism which guarantees silky smooth closing every time. No need to preheat the oven with coolStart, simply put frozen food items inside and set the timer; the oven does all the rest for you without fuss. All of these features are controlled from the high quality TFT Display, offering highly legible text and images from all angles. Cleaning is (almost) a thing of the past thanks to Siemens’ very own activeClean, a fully automatic system which reduces grease and grime to a fine dust allowing for truly effortless cleaning. You’ll never have to worry about cooking chicken straight after cheese on toast ever again. Behold the genius cookControl Plus, which guarantees you success when cooking a number of preset dishes. Finally, for those (like us) who try to be as environmentally friendly as possible, the CB675GBS1B boasts an impossibly high A+ energy efficiency class. Efficiency is the name of the game, and once again the Germans are at the forefront of innovation.